Recently Clarke Historical Library hosted a reading by flash fiction author Desiree Cooper. Her first book, Know the Mother, was recognized by the Library of Michigan as a 2017 Michigan Notable Book. Cooper is a former columnist for the Detroit Free Press and found the average column length of 750 words to be a natural bridge to flash fiction, in which an entire story is told in that space. The readings she selected for her CMU presentation were wide ranging, but all came back to the universal theme of motherhood. Each piece was both poignant and evocative, immediately recognizable to mothers, daughters, sisters and wives. With the tight constraints of flash fiction individual words become especially powerful, carrying layers of meaning based on perception. In some pieces race held the key. Elements of Cooper’s own experiences show up in her writing, but her stories are not purely autobiographical. Her first person narratives take on many personas. For her CMU visit, Cooper chose the format of an instant book club. She would read a story and the audience discussed it before she moved on to the next one. The stories were all from her book Know the Mother. She opened with “Mourning Chair” about a mother waiting for her daughter’s return home and imaging the worst. “Ceiling” was about the reaction received when a young attorney requests maternity leave. “Soft Landing” was followed by a discussion of levitation dreams. An unexpected ending to a night out for a couple of new parents is the subject of “Origins of Sacrifice.” The closing piece was “In the Ginza” which explores perceptions of interracial relationships in post WWII Japan. Cooper spoke of how she sought out the work of Detroit artists for her book cover. She found much that she liked, but none clicked as just right. Through the internet she eventually connected with Karin Miller, a South African digital artist. 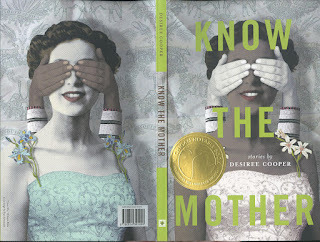 It’s Miller’s work seen on the memorable cover, featuring a very famous person with hands covering both her eyes and identity. On March 28, the Clarke was delighted to host our third annual day of international children’s literature. 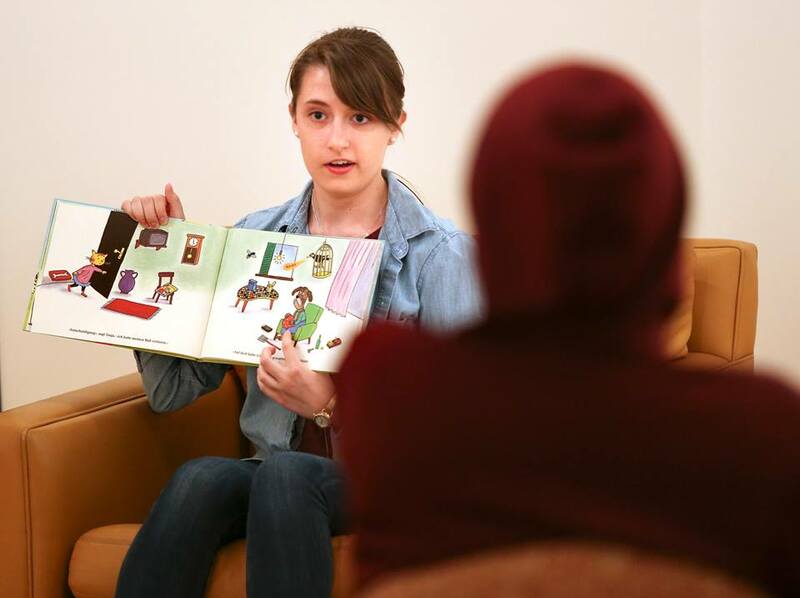 For the past two events, we have asked Central Michigan University students whose native language is something other than English to read a book from our collection in their native language – we have heard students read in Arabic, Chinese, French, German, Hindi, Russian, Spanish, Swedish, and much, much more. This year, we expanded the event and invited students from CMU’s English Language Institute and CMU’s Dept. of World Languages and Cultures (formerly Foreign Languages, Literatures, and Cultures). We also hosted a panel discussion made up of five CMU professors in the evening who discussed youth literature as a vehicle for communicating culture. To start the morning off, we welcomed students from the English Language Institute. Each student had the opportunity to read a book in their native language and a second book in English to practice their newly learned English skills. To begin the afternoon, we invited CMU students from all corners of the globe to read a book in their native languages. This year, we had eight readers read us a story in seven different languages – Arabic, Chinese, Hindi, Japanese, Persian, Spanish, and Telugu (a language from India). During or after reading the story, each reader summarized the story in English for the audience. All of our readers read excellent stories that were not just simple “kiddie books.” These stories, when read and translated by our readers, shared a little bit about the cultures in which our students grew up. Following the international student readers, we invited students who study languages as part of their coursework at CMU to read in their second, or in some cases, third, language. Eleven students and two professors from the Department of World Languages and Cultures read from the wide range of French, German, and Spanish books in the Clarke’s holdings. The levels of the students ranged from beginners to those with near-fluency and we were delighted to give these students a chance to showcase their skills. With children’s books in over 40 languages from over 60 countries, the Clarke looks forward to the opportunity each year to hear these books read in the language in which they are written. We are lucky that Central Michigan University has such a rich diversity of students, giving us access to these outstanding cultural artifacts. On March 28, 2017 the Clarke Library, in cooperation with the Department of Foreign Languages, Literatures and Cultures, the Department of English Language and Literature, and English Language Institute, sponsored a day-long event celebrating the importance of international children’s books. During the day over 90 students participated in an event where students who were learning English as a second language and English-speaking students read and explained story books printed in a language other than English. 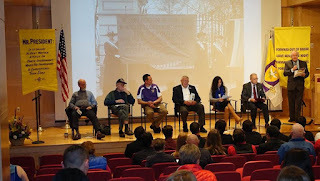 In the evening a panel of five CMU faculty members discussed the importance of the activities that had gone on throughout the day. The panel, moderated by Professor Amy Ransom (Foreign Languages, Literatures, and Cultures), featured Professors Anne Hiebert Alton (English Language and Literature), Carolina Gutierrez-Rivas (FLLC), Gretchen Papazian (ELL), and Daniela Richter (FLLC). Anne Hiebert Alton spoke of how children’s literature opens to students the cultural mores of a society, as well as differences minor and significant. As a simple example she made note of the differences in words found in the British and American editions of the many Harry Potter books. In Britain Hogwart’s owls delivered the post daily – in America the same owls delivered the mail. Similarly in America Mrs. Weasley gave Harry a sweater for Christmas, while a British reader would learn of the lovely jumper Harry received as his Christmas present. Gretchen Papazian spoke about children’s literature as a way to gain insight into American diversity issues, discussing books published in English and Spanish, as well as the use of African-American vernacular. She also pointed to the use of color as an important tool in children’s literature. Islamic culture has vested the color green with great importance, and this cultural fact played an important role in a recent book discussing Islamic immigrants to America. In the book, a newly arrived Islamic elementary school student who goes on a class field trip to an apple orchard baffles the American students by picking a green apple, rather than a red one. After some confusion the class comes to understand the importance of the color green to their new classmate. 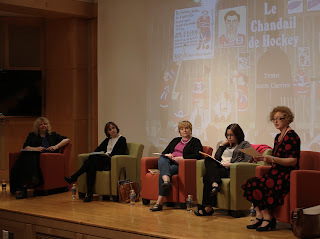 Daniela Richter discussed her personal use of children’s books to understand American culture. Born in the former German Democratic Republic (East Germany) children’s books that did not reflect the party line, while not completely unavailable, where hard to come by. The family’s German translation of Tom Sawyer was thus something of a treasure. She discussed how when she came to America as a high school exchange student, she read children’s books to help understand the United States. Her gateway book, she acknowledged was William Goldman’s The Princess Bride. In teaching German at CMU, Professor Richter talked about her use of a children’s book explaining the experiences of a Romanian immigrant family in modern Germany. What she found interesting was the amount of “back story” she needed to share with her American students before they could understand the “simple” children’s book. Bundled into the volume were numerous assumptions about both Romanian and German culture which the author assumed any native German reader would understand, but which did not travel well across the Atlantic to a room full of second year German language students. Professor Carolina Gutierrez-Rivas, who works in translating material from Spanish to English, discussed how figures of speech in one language can reveal important details of culture. She is particularly interested in speech acts. A speech act is a special unit in the language that allows us to do things with words. For example, when a speaker says “it’s cold in this room,” the probable implication is that the hearer should turn up the heat. Her latest research focuses on the degree of egocentrism (care for oneself) and altercentrism (care for others) in youth literature. She uses these kinds of utterances to study politeness and issues of race, class, and gender. In her translation class, she also uses short poems and micro stories. Panel moderator Amy Ransom spoke last, discussing a children’s book dealing with prejudice based on Canada’s national sport, hockey. Maurice “Rocket” Richard was a player for the Montreal Canadiens from 1942 until 1960 who became the iconic French-Canadian hockey player. According the story, as a boy he mistakenly received a blue and white jersey of the English speaking Toronto Maple Leaf. The Maple Leafs were the Canadiens bitter rival, and more broadly a focus of French speaking Quebec’s angry sense of mistreatment at the hands of Canada’s English speaking majority. When the young Richard appeared at the local hockey rink wearing his Toronto jersey, he faces significant trouble, which he responds to both verbally and with a talented hockey stick. The story’s point, that those who feel the sting of prejudice can, in turn, be themselves prejudiced, is an important life lesson. It was an evening of fascinating discussion, and included two pieces of trivia worth sharing: the “National” in National Hockey League (NHL) was originally Canada, and in the Old East Germany bananas were a rare delicacy, that usually appeared only around Christmas and for which people would stand in long lines to buy. Who knew? 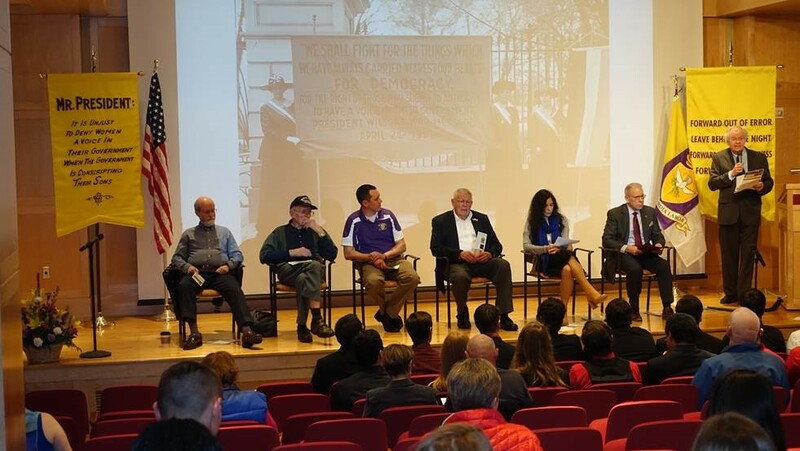 In a particularly timely presentation Professor Sally Howell of the University of Michigan Dearborn spoke on March 16 about the history of Detroit’s Islamic community. 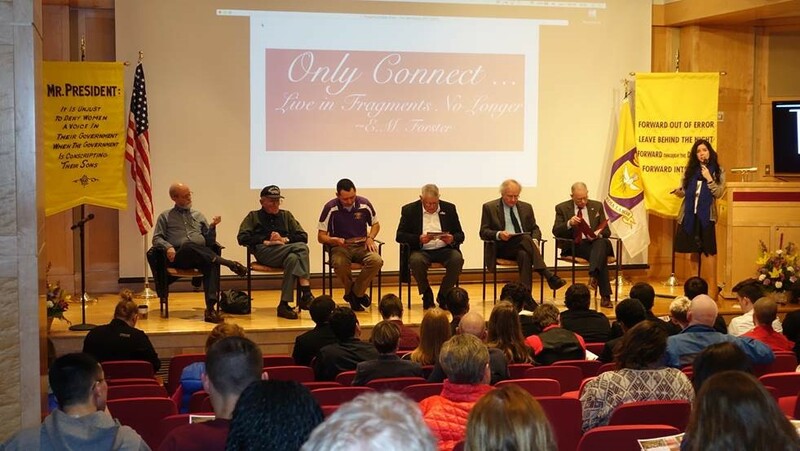 Professor Howell’s presentation made clear how deeply rooted Islam is in southeastern Michigan, while at the same time noting the evolutionary changes that help contrast Islam in the Detroit area with the faith as it is practiced in the Middle East. America’s first mosque built by Muslims opened in Highland Park, Michigan in 1925. Like so many other immigrants these people had been drawn to Highland Park by Henry Ford’s Model T plant, and its $5 a day pay scale. Although the mosque opened in 1925, Islamic religious leaders had been active in the community for more than a decade. The first religious leader in the community, Kalil Bazzy arrived in 1913. He was a man of great piety, but spoke no English. Before he left Syria (today southern Lebanon) he had received a note, written in English, by his brother, who was already in Detroit. Bazzy was instructed by his brother to pin the note on his clothing when he arrived in the United States and show it to officials. That note got him from New York to Detroit, onto a local streetcar, and off the streetcar at LaBelle and Victor Ave. There, too his utter amazement, he found a community “Arab, all Arab.” As another immigrant related, “You could walk up and down Victor Avenue and not hear one word of ‘American’.” Bazzy, a Shi’a, was a man of piety, but as some noted,no formal religious training. Soon after Bazzy’s arrival in Highland Park, he was joined by another man of great piety, Hussien Adeeb Karoub, who from the Bekaa Valley, about twenty miles from Beirut. Unlike Bazzy, Karoub had received religious education. He could recite the Qur’an from memory. His brother Mohammed, who had already spent five years in America, recognized that bringing his devout brother to Detroit to lead a religious community would be of great benefit. Thus Karoub came to America. His Sunni roots at first made many of the Shi’a uncomfortable, as there was a long tradition of Shi’a harassment and persecution in Syria. But Karoub proved a tolerant man who reached out to all in the Islamic community. In the 1920s, the Islamic community consciously reached out to African-Americans with heartfelt statements regarding the equality of all people in the eyes of God. Many African-Americans chose to accept the faith. Other African-Americans would incorporate Islam into their own religious tradition. The Nation of Islam, although today headquartered in Chicago, was founded in Detroit during the 1920s. The Nation of Islam’s Temple #1 still remains open for worshippers in Detroit. 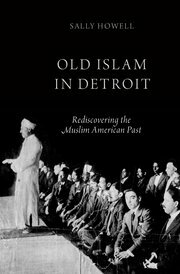 Howell told a fascinating story of the growth of Detroit’s Islamic community, as well as its interaction with Detroit’s African-American community. Her thoughtful discussion of the nation’s largest Islamic community was one of value and importance. 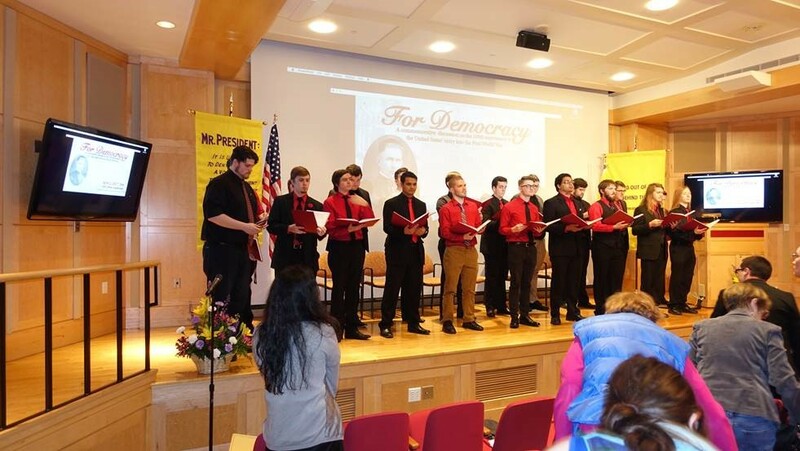 On the one hundredth anniversary of Woodrow Wilson’s request to Congress that war be declared against Germany the Clarke Historical Library, in conjunction with the CMU Veterans’ Resource Center and the Center for International Ethics, sponsored an evening focusing on the meaning of patriotism. In particular four veterans as well as Professor Hope Elizabeth May spoke about service to America. The evening’s honored guests were World War II veteran Staff Sergeant Earl Wickman, Korean War veteran Sergeant John Schuling, Vietnam War veteran Sergeant Larry Ashley, and Staff Sergeant T.J. Pierce, who served in Afghanistan. Each gentleman spoke on what service meant to him. Hope Elizabeth May expanded the discussion of service by sharing how individuals like Central President E.C. Warriner, who had been deeply involved in the Peace Education movement of the early twentieth century, reacted to the war, as well as how Woodrow Wilson, following the logic that led him to ask America to enter the war, came to ask Congress to support the constitutional amendment allowing women the right to vote. “Somewhere in France, about to go over the top. Two other Central students died in the Great War, along with more than 11 million soldiers, of which more than 116,000 were Americans. Frank Boles shared how Woodrow Wilson framed the reasons for this loss of life in his request for a Declaration of War. He made it clear this was not a war against the German people. Even though he blamed Germany’s leaders for beginning the war, nevertheless the war was not really about striking back at those leaders. 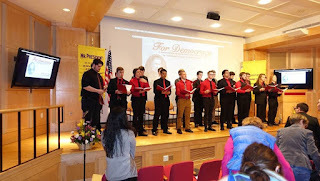 The evening’s remembrance also included a rendition of Taps by Morgan Lillie, which preceded moment of silence for those who had died, and closed with the singing of the Star Spangled Banner by the Phi Mu Alpha Sinfonia, a CMU student group. Thinking about World War I in the context of broadly defined patriotism is an important way to help all of us not only honor those who served, but thoughtfully examine the meaning of service in a democratic nation. 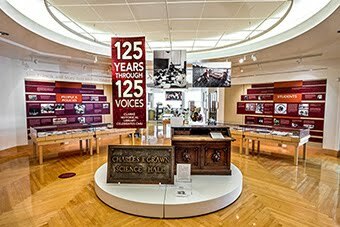 CMU will continue to recall the momentous events of 100 years ago, and discuss more current history, later this week. We will remember the day President Wilson signed the Declaration of War, on April 7, by a flag raising ceremony at 1:15 p.m. at the flagpole directly in front (north side) of Warriner Hall. The flag raised will be the Pro Concordia Labor peace flag which was designed in 1897 and envisioned by its creator as a universal symbol of peace. You can read more about the flag at http://www.proconcordialabor.com/Flag/. After the flag raising, beginning at 2:00 p.m. a discussion will be held in the Park Library Auditorium regarding the legal response to the Rwandan Genocide, which began April 7, 1994. The speaker will be Professor Jennifer Trahan, from New York University, who will share how the international response to the atrocities in Rwanda has influenced international law, including the creation of the historic International Criminal Court. For more information about the presentation please visit https://www.cmich.edu/colleges/chsbs/Abel/Speakers/Pages/Spring-2017.aspx.